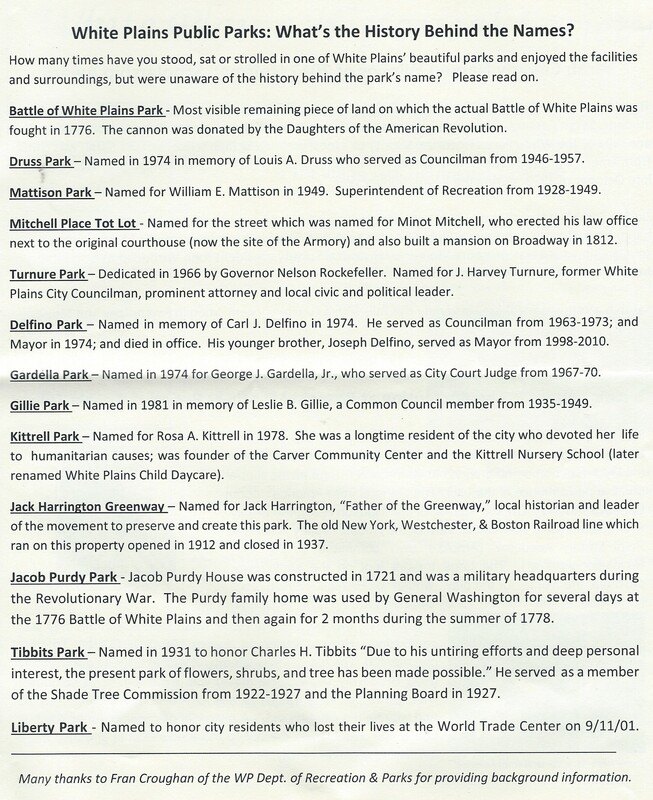 It should be noted that the City has other parks (see information posted below from City’s Park’s & Recreation Dept. ), plazas and playgrounds (not in a park) and not listed in Newsletter above (i.e. Renaissance Plaza, Bark Park, Bryant-Mamaroneck Park & Mitchell Place Tot Lot). Baldwin Farm is named for former farm that makes up the park. Information can be found in blog entry on Quarry & Farms. There are private gardens, parklets (memorial gardens) and Westchester County parks/gardens throughout WP. Battle Hill Park is a recreational park on Battle Hill and is also named for hill. Chatterton Playground is named for the first name for Battle Hill during Colonial times. The hill refers to the family living on the hill. Chatterton was tenant farmer of Philipse Family. Ridgeway Nature Trail starts on Ridgeway school. Garden of Remembrance commemorating Holocaust is on Westchester County land on Martine Ave. Bronx River Parkway Reservation is a County park running in western part of City. I hav a question that has been eating at me for the longest time. What is the story about the house on Soundview Ave. that looks just like the White House in D.C. What is the year of construction. Some websites say it’s 1900 but I saw somewhere else that it is actually 1815. I would be very grateful if you could let rem know. I could use an address but the only house I researched was the Soundview Manor. I googled the street but only house that might look like WH is 61. Real estate websites list it as 1924 build. It really doesn’t look like its from the 1800’s and few houses in City that still exist date from that time. Assessors office has info on properties but some don’t have original build date but when renovated or moved. Most houses in WP were constructed in 20th Century. City had much less people before 1910 when train that still exists went electric. Local history room at library reopened and there are books with old houses.